A life in a webbis: Past Blog Post : Happy Birthday Bie! Hello friends. Assalamualaikum wbt. I know this has been long overdue but i still want to post this one out before we are officially become husband and wife this coming Saturday. 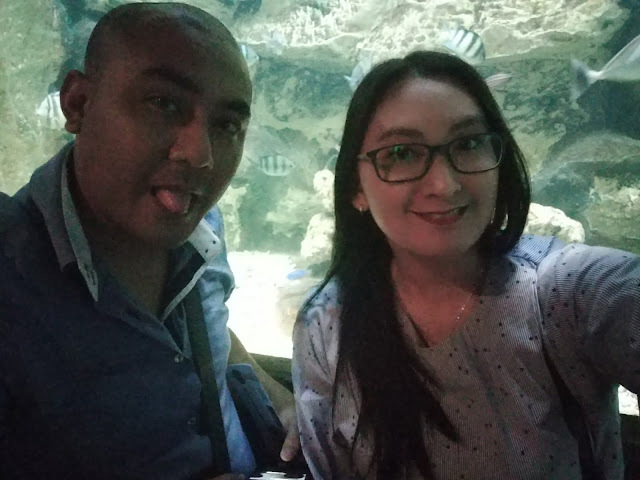 This entry is to just reminisce my fiance's birthday celebration on 29th January 2017 at KL Tower. I bought the Hi-Tea voucher via Groupon before hand and made an arrangement for two person, window seat having Hi-Tea together. Till today, i feel like i am the luckiest girl in town to have known this guy for two years and not even once i have shown my old habit of anger and ego. I mean, it may sound impossible that i did not even shown once my bad bad habit but it is true. With this guy, i have seen the truest and sincere love. Even though a lot of my friends were a bit skeptical at first after my last relationship and how fast i could just start a new one. Well, some say i cheated but i do not care. My happiness is not at their hands. I create my own happiness and i just can't deal with my unhappiness in life in my previous relationship. Well, enough about myself. This blog is about my fiance. This birthday celebration is to celebrate his early 30's. To embrace that this would be his last single birthday celebration and his birthday after this year would be more awesome and well planned. Since i have been planning to celebrate his birthday in a very unusual way, i thought why not just celebrate it at a place which i think he has never been to. Before entering the Atmosphere 360 Restaurant at 3.30pm, we had a chance to enter into the Blue Coral aquarium (it was part of the Voucher) to look at some underwater fishes. I of course was super excited to see my favorite fish of all, the puffer fish! But instead of taking pictures of it, i took a loooong video which i have cut it down. Haha. The foods were okay at Atmosphere 360. The rojak buah was awesome and since it is Hi-Tea, it has a lot of sweets and desserts served. But they also have other heavy foods such as noodles, tau foo fah and more! It was then i did notified the restaurant that it was his birthday so they did played a birthday song and served him with this yummy chocolate cake! It was a memorable journey for both of us, celebrating his birthday at Atmosphere 360 KL Tower. I hope that in the years to come, we will continue to celebrate important days like this together forever, insyaAllah.